The outrage over this gross injustice continues to build, and Cadbury's silence is deafening. First, if you haven't done so already, read the original post exposing the conspiracy. The people demand answers, Cadbury. The Consumerist is on the case, thankfully, and momentum is building. While some on the thread blame Global Warming for the shrinkage, Mr. Shiney calls out for full page ad buys in the New York Times calling Cadbury out to answer for their lies. The original video on YouTube has now been viewed over 172,000 times. The folks responding to Neatorama's post have also uncovered potential evidence that Hershey's is involved, although that smacks of a deliberate disinformation campaign ala Swift Boat Veterans if you ask me. CBS affiliate KXMA in Dickenson, ND is calling for nothing less than a Congressional Investigation. Finally, there is this moving expression of outrage and sadness by one of the artists at YTMND. Stop the madness, Cadbury! Send us your official response we will post it here for the world to see. You cannot stay silent forever! The contextual ads on this post are a hoot! said Miss Cellania on April 10, 2007 4:24 PM. Has the mass of the eggs changed, or just the volume? They are sold by weight not volume. Perhaps they are using a denser filling. If Cadbury are reading this, please send samples. said Pondscum on April 11, 2007 1:40 AM. 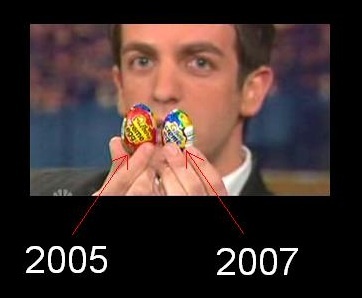 I used to have a local record of eating 21 Cadbury Eggs in one sitting, without throwing up. Now my record could be attainable b/c the eggs got smaller. I am not happy about this. said johnj189 on April 13, 2007 8:00 AM. said Thomas K. Arnold on April 22, 2007 2:07 AM. We featured this on our site Unbound Edition today. I think you'd enjoy it. I won't post the URL because I want to get posted, but just Google us. said boyd on April 24, 2007 2:18 PM. said eve 1983 on April 28, 2007 9:32 PM.